You are looking at purified awesome: This is Ford's latest Super Duty diesel, a turbocharged, reverse-flow, 6.7-liter V8 designed without the help of an outside contractor. It's nicknamed "Scorpion." Notice anything weird about those cam buckets? 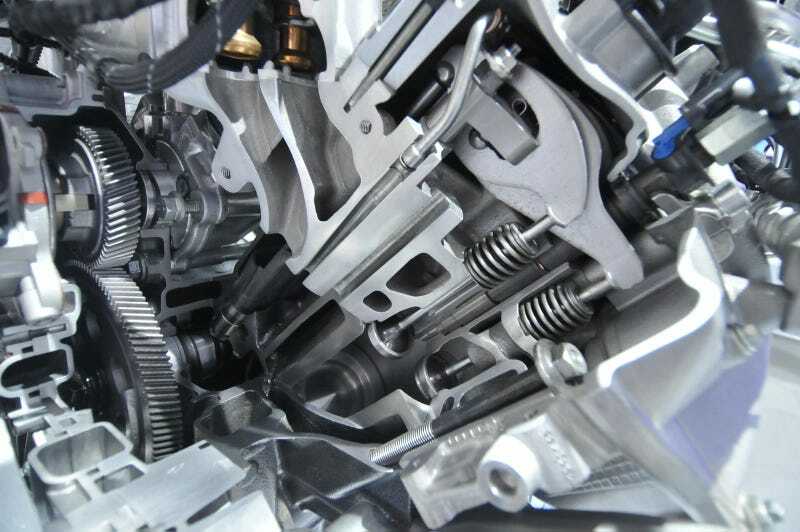 You can find an in-depth look at the Scorpion's technical craziness here, but in the meantime, take a gander at the valvetrain. In the interest of limiting wear, the 6.7 boasts something called "single plane" bridgeless rocker arms. Basically, instead of using a bridge to open or close each set of valves in tandem, each valve is attached a single rocker. Here's the funky part, though: Due to packaging constraints and a desire to avoid wonky angles, the Scorpion uses just one cam follower (a.k.a. bucket/tappet), not two, for every pair of pushrods/valves. If you look closely, you can see the cam bucket sitting down in the valley, along with its hollow follower and a couple of pushrods sticking out of it. Cool, eh? *Because we are immature fools, we must point out the following: That is, in fact, what she said.